Primeview USA, a provider in advanced display solutions, has now completed the re-design of its Partnership Showroom on West 44th street in Manhattan, which it expects to set the style standard and practices for all other tech showrooms around the country. The Partnership Showroom, under construction since November 2013, will now be open to the public following its kick-off event on Thursday February 6, 2014, which is by invitation only for the consulting, design and architectural community. Esthetically, the industrial-style showroom boasts vaulted ceilings and raw concrete flooring. Primeview’s previous NYC showroom was a place where customers could experience first-hand Primeview’s unique and powerful display solutions based on nearly 20 years of research and development. To usher in 2014, the showroom now has a completely different purpose. It demonstrates the first of its kind partnership amongst several leaders in the A/V world so visitors can see how a complete system truly comes together with the participation of Anacore Syntheses (Multi- touch Collaboration Software), Vista Systems & TVone (processing), Magenta (Extender Technology), Haivision (IPTV/Signage Software), Peerless-AV Mounts, Key Digital (Control Systems) and AV integration team at AVDS. 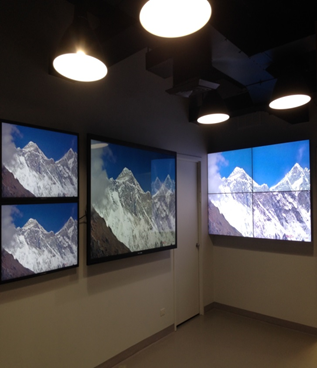 The new showroom has complete floor to ceiling Plasma and LCD video walls, 4K, HDBaseT solutions and immersive multi-touch experience opportunities. Although the showroom design and implementation was spearheaded by Primeview personnel, it would not have been possible without the help of the construction team from Sahara Builders, low-voltage solutions from Global Communications Contracting who ran HDBaseT Cat6 cable solutions throughout, the broadcast integration team at AV Design Services, and all of Primeview’s manufacturer partners. “As an initiative, The Partnership Showroom is one of purpose and convenience,” said Peter Maag, Chief Marketing Officer of Haivision. Haivision’s CoolSign digital signage and Makito to InStream Mobile solutions are integration highlights. One of its most appealing elements is the “feature video walls” throughout the showroom, which utilize Peerless-AV mounts and Vista Spyder and TVone processing. The design, ease of use and installation of each are surpassed. Perhaps the most elegant yet technology-driven component is the simplicity of Key Digital’s Compass Control via Apple iPad/iPhone. Compass Control was built from the ground up with A/V switching and iOS devices in mind. “Compared to other higher-end control systems, Compass is 30 to 50 percent more affordable to the dealer," Said Michael Lakhter, VP of Sales of Key Digital. Another high-tech feature Primeview USA is testing at the re-designed Manhattan showroom is software that allows customers to have multi-touch collaboration. Connected to Primeview’s 84-Inch 4K multi-touch display will be Anacore’s Synthesis Multi-touch collaboration platform that supports the highest levels of conceptualization, visualization and collaboration. It integrates the most common collaboration tools into an interactive digital canvas. Users have the ability to whiteboard, annotate on images/videos/documents, access a web-browser, bring in live sources (laptops, video conferencing, and mobile devices) and most importantly capture the entire process. "Synthesis creates a persistent learning environment, that helps convert the common meeting culture into a culture of getting work done," said Brandon Fischer, President of Anacore.